Stalking is the unwanted or obsessed behavior done by an individual or group onto another person. Every state in the USA has laws against stalking and they do vary. However, a good guideline is: if you experience at least one of behaviors on at least two separate occasions it’s most likely you are being stalked. A stalker can be an individual you know very well, a little, or even not at all. The majority of them have dated or been involved with the victim. A common misconception is that it only happens to females. 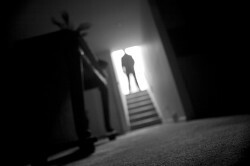 While women are statistically stalked more, males are also victims. Unfortunately, most victims don’t look for help until the situation has become dangerous. What are the behaviors of most stalkers? It’s not your fault. Unfortunately stalking and harassment is prevalent in the United States and world. According to the National Center for Victims of Crime, 6.6 million people are stalked in one year in the United States alone. Don’t try and handle this on your own. These are very dangerous situations. Usually the police aren’t helpful due to lack of evidence which means you are the one on the hook. When this happens turning to a private investigator is your best move. What can our agency do for your situation? First, we ask that you write down every stalking event that happens along with keeping all emails, letters, or any other useful evidence. This will build your case and greatly assist you in court. During our free consultation we will analyze your situation and direct you to the best course of action. TCI is exceptional at gathering evidence, locating people, and confirming identities. We do this through: intelligence gathered on the ground, public records, access to proprietary databases, surveillance and counter-surveillance, hidden cameras, experience, and other methods. Don’t leave this delicate matter in the hands of amateur. This may be one of the worst times of your life, let our agency give you peace of mind and eliminate all worries. Call Third Coast Investigations– Professional Wisconsin Private Investigators now for information regarding Bug Sweeps, any other service or for a free phone consultation.